Tonight is our in between night before our kombucha is ready for the week. Kombucha is a great probiotic, fermented tea that takes about 7-10 days to culture. It’s slightly carbonated when finished, and teeters between slightly sweet and vinegary sour. My children have grown to love this stuff. I have found the tutorials at this site to be most helpful. Read here as to why someone would want to drink probiotic beverages. 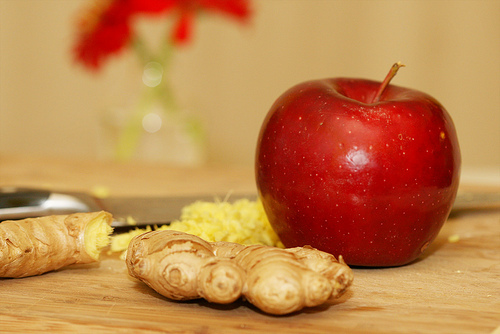 Back to in between night, I decided to try out my new blend of ginger and apples in the water kefir. Water kefir has not been as big of a hit with the family as kombucha. Yet, I am determined to find a combination they will like. Ultimately, I will probably have to use fruit juice as part of the liquid to ferment in order to get the desired flavor the kids will enjoy. Tonight was a partial victory (meaning half of the children able to consume these beverages liked it). I purchased my water kefir grains from Cultures for Health. Fill a 1/2 gallon jar with filtered water. Pour 1/2 cup sucanat, rapadura, or other non-refined sugar in. Screw a lid on top and shake really hard until the sugar dissolves. Add your water kefir grains (about 3 tablespoons). Throw in a small handful of dried, crystallized ginger, and a bigger handful of dried apples (non-sulfured). Place a plastic lid on loosely and set on the counter for 24-48 hours, after which I leave it in the fridge with the lid on tight for another day. Then you can either drink it as it is, or with a little apple juice. Remember to strain out your grains and start over again. You can use pretty much any dried fruit for water kefir, just steer away from citrus as it can weaken the grains over time. Oh, and check out Real Food Wednesdays for other great nourishing recipes.